Village Builders announces the opening of their new Bellview model home in The Reserve at Clear Lake City, now open to the public. Village Builders announces another opportunity for Houston area residents to experience the thrill of a new home with the opening of their new Bellview model home in The Reserve at Clear Lake City. 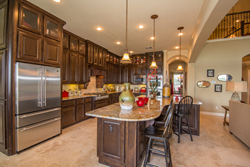 This popular new home community located in Houston, Texas features Village Builders Stunning Classic and Kingston Collections of home designs. Village Builders currently has 16 plans to offer to new residents desiring to build larger, luxury homes in the Houston area. The wide array of luxury designs available in The Reserve at Clear Lake City includes homes ranging in size from 3,094 square feet to 4,425 square feet with prices starting in the $480s. The Reserve at Clear Lake City is located in the thriving Bay Area - just minutes from downtown Houston and the coast via the conveniently located Sam Houston Parkway and Gulf Freeway. Residents of The Reserve at Clear Lake City will enjoy a wide range of family oriented activities. The serene, open, green spaces and landscaped walking trails winding throughout the neighborhood are only the beginning of what makes residents happy to arrive home. Houston area residents and those considering relocating won’t find it hard to discover exactly what they’re looking for in The Reserve at Clear Lake City. Village Builders offers luxury homes with stunning features not limited to spiral staircases, butler’s pantries, formal dining rooms, gourmet island kitchens, and much more. The stunning two-story Bellview model home by Village Builders boasts a beautiful curved staircase, family room with fireplace, formal dining room, island kitchen with adjoining breakfast nook, and relaxing covered rear patio. The home also features a study, game room, media room, and an optional outdoor grilling area. The first floor master suite includes a sitting area, bath with dual sinks, separate soaking tub and shower, and spacious walk-in closets. For more information on available floor plans, pricing, and homesite availability, please visit our Welcome Home Center at 13439 Travis Heights Lane, Houston, Texas 77059, contact our New Home Consultant Brenda Gardner: 281-910-2174, Brenda.Gardner(at)lennar(dot)com, or visit us online at http://www.villagebuilders.com/houston. Lennar was established in 1954 and is one of the nation’s leading home builders. Lennar builds in communities in the Greater Houston area. Visit our website at http://www.Lennar.com/Houston to find new homes throughout greater Houston. Listed on the New York Stock Exchange (LEN and LEN.B), the Miami based homebuilder has built over 800,000 homes in more than 50 cities coast to coast. Village Builders is Lennar’s luxury brand of homes.